Our weekend was for the birds... in a good way. The run got a tidy-up. Knocked down cob webs, raked everything, and put down new bedding... we're giving rice hulls a go, on a suggestion from Robin and Sean. We like it, so far. The chickens like it, too, and were happy to help spread it around, and sort through it. Good chicas. I've started calling Pippi and Pepper Pip O'Pep, because like the Cuckoos, Thomson, Thompson, and Tamsyn, we cannot tell the two Wyandottes apart. Oh dear. I'm just noticing those tail feathers, and the ones cascading at her wing tip. Those look very rooster-ish. Pip O'Pep? Hello? Are you a fellow? 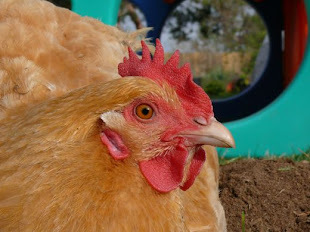 Oh my... the steely gaze of Gallus gallus domesticus. All five of the newest chicas... one Ameracauna sitting below. We still haven't named them all. I don't know why. They stick together, and roost in the oddest places. I've lost count of the number of times they've settled in for the night outside, on the roof of the run! Among five chickens I wish there was enough collective sense to figure out they're choosing the worst spot possible. William has to climb up, gingerly navigating the framing of the run... he slides a broom under each one, then extends them over to the edge so Geoff can grab them. One by one. It's quite a rescue operation. Are you ready for my hypothesis? This really is based on limited evidence, but I am in love with my supposition! It goes like this... Friend was visiting all day, taking a record number of peanuts, and being as handsome and endearing as ever, because he knows something about El Niño. Geoff fed Friend. Alex fed him. William, Maria, and I fed him. Andy fed him. Leo fed him. Jesse and Jarett fed him. And we put down more peanuts for Friend's shyer companions. And I believe that this epic day of peanut stashing is because Friend, our wise prognosticator, Aphelocoma californica, knows winter is coming, and he knows it will be particularly wet, and wintery, and cold, and wintery, and drought dampening, and wonderful. Prudent and wise, discerning and diligent, Friend. We love our feathered friends. We love introducing our feathered friends to other friends. I loved seeing Andy's expression. Unfortunately, I didn't have my phone on me when Jesse and Jarett met Friend, but I can still hear the awe and delight Jarett uttered when he fed him. The sound of joy is... well, I guess it's indescribable, and good. I love hand feeding my chickens so I can only imagine how awesome it is to feed a real wild bird! It instantly elevates you to fairy princess status, and the effect always shows in the smile of anyone who feeds Friend. I wish you all could be here to try! Those are some seriously gorgeous photos of Friend! Beautiful! I'm looking forward to the day I get to join in. Interesting that he seems to know what kind of winter is approaching. He stays local though, right? He doesn't migrate, does he? Should we keep our fingers crossed regarding Pip O' Pep? Or is it pretty certain that a rooster is, indeed, in the hen house? Handsome fellow! Smart, too, right? I'm sure this weather hypothesis has nothing whatsoever to do with my wishful thinking! As for Pip O' Pep... I have no idea!! Either she is obviously a rooster and I am in utter denial, or she's a hen and all is right with the world. Gah!